Aamras or Mango juice is prepared with ripe mango slices. Mango also known as “King of Fruits” is a delicious fruit with a great nutritional value. Its unique flavor, fragrance, taste and health benefits makes it a perfect summer drink. Aamras contains sufficient amount of polyphenols, phytochemicals, carotenoids, antioxidants, omega-3, vitamins, and omega-6 which are beneficial for human body. Aamras helps to prevent heart ailments and keeps the heart healthy as it contains Beta-Carotene, Selenium, Potassium as well as Vitamin-E. Being rich in copper and iron, it also helps to produce blood corpuscles. 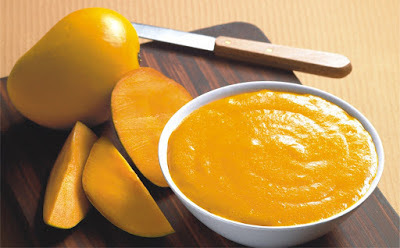 Aamras improves your immune system, assists in digestion, regulates blood pressure, curbs anemia, and relaxes muscles. Vitamin C stimulates the production of White Blood Cells which helps in destroying the bacteria and free radicals. Aamras contains isoquercitrin, astragalin, quercetin, methyl-gallat and gallic acid which are beneficial in lowering the risk for various cancers. The low glycemic index of Aamras helps to manage the the blood sugar level. Potassium regulates the blood pressure and electrolyte mechanism in the body. Vitamin A in Aamras rejuvenates the skin and makes it soft as well as supple. When a small quantity of Aamras is applied over the face, it improves the complexion and makes the skin glow. The high content of Vitamin E invigorates the hormonal mechanism and improves stamina. Aamras is beneficial for pregnant women as it contains iron which maintains the oxygen flow and HB level. It also helps in the muscle relaxation due to presence of calcium and magnesium. Aamras contains Flavonoids, beta-cryptoxanthin and alpha-carotene which rae necessary nutrients for healthy eyes. Previous article How Many Calories Are There in Nariyal Pani & Does It Have Any Health Benefits? Next articleHow Many Calories Are There in Rooh Afza & Does It Have Any Health Benefits?